What is this book about?This book is a comprehensive introduction to the Java programming language, updated thoroughly (more than 35% new and updated) for the latest SDK 1.5 release. This book shows readers how to build real-world Java applications using the Java SDK. No previous programming experience is required. The author uses numerous step-by-step programming examples to guide readers through the ins and outs of Java development. 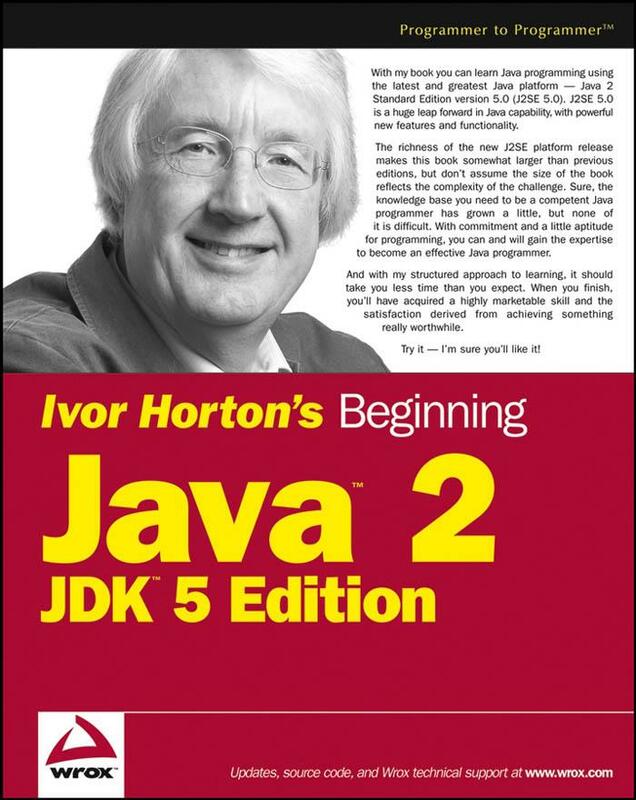 In addition to fully covering new features of SDK 1.5, such as generic types, the author has also added new chapters on Java database programming with JDBC and Java programming with XML. For junior- to graduate-level courses in computer graphics. Also, widely used for professional self-study. Reflecting the rapid expansion of the use of computer graphics and of C as a programming language of choice for implementation, this new version of the best-selling Hearn and Baker text converts all programming code into the C language. Assuming the reader has no prior familiarity with computer graphics, the authors present basic principles for design, use, and understanding of computer graphics systems. The authors are widely considered authorities in computer graphics, and are known for their accessible writing style. A free Open GL supplement is available via the texts Prentice Hall Catalog page. 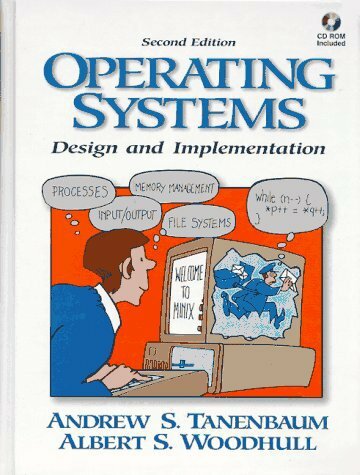 The Second Edition of this best-selling introductory operating systems text is the only textbook that successfully balances theory and practice. The authors accomplish this important goal by first covering all the fundamental operating systems concepts such as processes, interprocess communication, input/output, virtual memory, file systems, and security. These principles are then illustrated through the use of a small, but real, UNIX-like operating system called MINIX that allows students to test their knowledge in hands-on system design projects. Each book includes a CD-ROM that contains the full MINIX source code and two simulators for running MINIX on various computers. James Keogh (New York, NY) is a faculty member of Columbia University where teaches a breadth of computer science courses in their CTA program. Keogh developed the Electronic Commerce track for Columbia University and was the first person to chair the track. 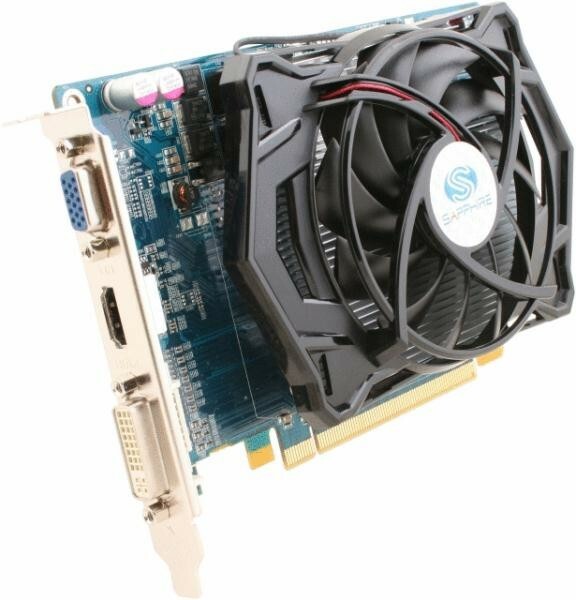 Loaded with the latest features, the ATI Radeon HD 4600 Series graphics cards deliver a level of gaming performance previously only found in high-end graphics cards. Redefine the way you play HD games and enjoy unprecedented levels of graphics realism powered by 320 stream processing units, up to 1GB of memory and support for Microsoft DirectX®10.1 games. Upgrade your graphics card and watch Blu-ray movies and play HD content with incredible visual fidelity1or take your experience to another level with new multimedia capabilities. Do it all with break-through energy efficiency that doesn’t compromise performance. Couple that performance with random writes of 14,000 IOPS and sequential writes of 130MB/s to unleash your system. The Intel Data Migration Software clones the operating system and files from a hard drive or SSD to any Intel SSD. 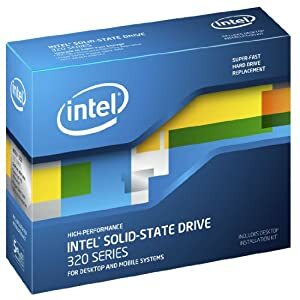 Intel SSD 320 Series come pre-configured with Advanced Encryption Standard (AES) 128-bit full-disk encryption capabilities. 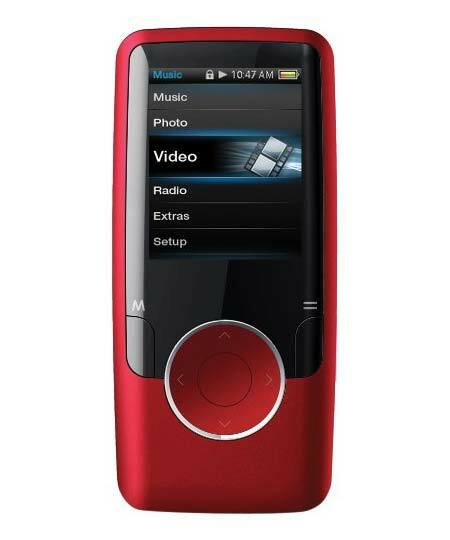 Coby’s MP620 Video and MP3 Player offers playback of music, videos, photos, and text files, with intuitive navigation and a brilliant 1.8-inch TFT LCD display. With 4 GB of memory you’ll get enough room for about 1000 songs, and Coby’s Media Manager software is included for easy and hassle-free media syncing. A great media player without the huge price tag. A great media player without the huge price tag. Enjoy your favorite tracks with ID3 tag info such as artist, album, etc. displayed. Share your favorite photos one-at-a-time or in slideshow displays. 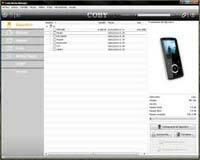 Use Coby’s Media Manager software to easily sync your device, or just drag and drop files. Enjoy your videos, pictures, and album art on the go with the MP620’s color TFT display. The MP620 features 4 gigabytes of flash memory on-board, enough room for up to 1000 songs. Get up to eight hours of music playback on a single charge with the integrated rechargeable Li-Poly battery. Navigate the MP620’s features with ease using the circular four-way button and middle “enter” button. Get to exactly what you’re after, right when you need it. The Coby MP620 is ready for your favorite music, movies, and photos, so you can take them anywhere–whether it’s for your own enjoyment, or a little sharing. Play back your favorite MP3/WMA music files for hours of entertainment. If your music files contain ID3 tags, you will be able to view your tracks by Artist, Album, or Genre. Create a quick playlist on the fly, enjoy random playback, repeat mode, and more. For the lyrics freaks, LRC files are also supported, so you can view the words (including synchronized timing display). Use the photo browser to explore and share your photo files. JPEG and BMP formats are supported, and the slideshow function makes a great way to share with friends. Support is offered for video in the MTV format, at 128×128 pixel resolution, and 25 fps (frames per second). Basic controls–e.g., fast-forward, rewind, scan, etc.–are provided for your convenience. Using the headphones and an antenna, the MP620 delivers FM radio, so you can check up on the news or your favorite programming on the go. Preset your favorit stations for quick access, or have the MP60 do a quick scan of local stations. To further dial in your sound, pick an EQ preset that works with whatever you’re listening to: Normal, Pop, Rock, Classic, Jazz, or Bass. The included Coby Media Manager software will let you convert your existing audio and video clips to the correct formats, for enjoyment on your device. You can also choose to handle the conversion in your own preferred way, and simply drag-and-drop files onto the device like any other system folder. This device uses USB 2.0 for speedy file transfers when syncing. A flurry of function with a ruggedly classic appeal, the Stuhrling Original Men’s Apocalypse Trinity Chronograph Black Ion-Plated Leather Watch has a lot to offer. This intrepid timepiece begins with a 45mm black PVD-coated stainless steel case with a fixed black carbon fiber decagonal bezel and a textured black crown with two black pushers. These elements surround a bold black dial, which is protected by a synthetic sapphire crystal and features luminous index and Arabic numeral hour markers and luminous skeleton hands powered by Swiss quartz movement The dial also features three multifunction sub-dials offering 60-second, 30-minute and day displays along with a scrolling date display window at the 3, 4, and 5 ‘o clock positions. A black alligator-embossed leather band straps this watch to the wrist, while a reliable buckle clasp ensures its secure placement. Finally, this watch boasts water resistance up to 330 feet (100 meters). If you need your watch to be more than just stylish, then this is the watch for you. Krysterna™ is proprietary to Stührling Original and refers to the crystals that are used in its timepieces. Krysterna™ stems from the eyewear industry and has more strength over a spread surface area than sapphire. Krysterna™ crystals are more scratch resistant than mineral crystals and more shatter resistant than sapphire crystals. 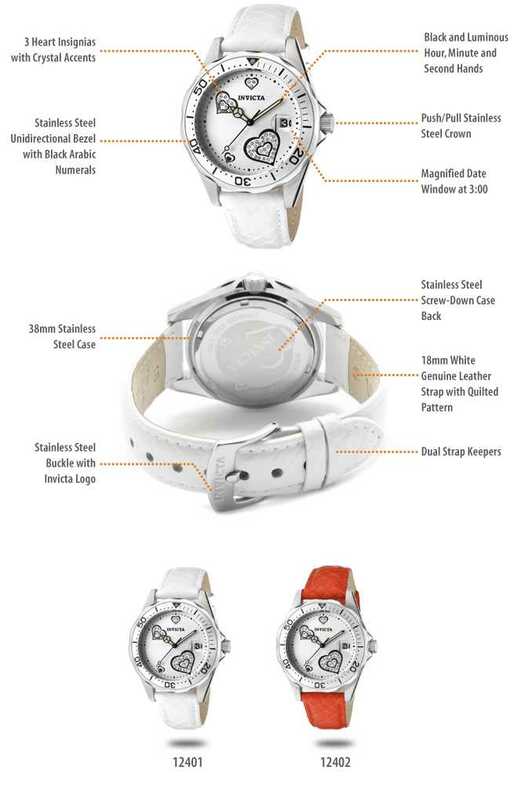 The heart reigns supreme in the Invicta Women’s Pro Diver Silver Heart Dial White Leather Watch. Boasting a timeless symbol of love, this wonderful timepiece begins with a round 38mm stainless steel case, a unidirectional stainless steel bezel and a textured, protected crown. These elements hug a sleek silver dial, which is protected by a mineral crystal and features luminous hands powered by Japanese quartz movement, along with a date display window at the 3 o’ clock position and three heart insignias with white crystal accents. A white genuine leather band with a diamond pattern straps this watch to the wrist, while a buckle clasp ensures its secure placement. Finally, this watch is water resistant up to 660 feet (200 meters), so this heart can beat on land or in the water. A lovely watch with a heart-felt character, bring this watch home to your accessories collection today and you won’t regret it. المدونة لدى وردبرس.كوم. قالب: iTheme2 بواسطة Themify.